In early 1988, visual artist, rock producer, and "non-musician" musician Brian Eno came to San Francisco. He'd made the trip to put together "Latest Flames," a "sound and light installation" using his own music and "television as a radiant light source" to "create a contemplative environment." He created this contemplative environment at the Exploratorium, a one-of-a kind museum of "science, art, and human perception" I remember fondly from my own childhood in the Bay Area (though alas, I didn't start going until just after "Latest Flames" closed). During that visit, he spoke on Berkeley's KPFA-FM about his great admiration for the very existence of the Exploratorium, which he thinks could never have happened in his native England, "too fussy" a country to accept such an experimental institution. He also emphasizes how much gratitude he thinks Americans should show for their public radio stations like KPFA, which, in contrast to the admittedly "great radio"-producing broadcasters of the U.K., work more loosely, with greater creative freedom not scheduled on "five-year plans." It surely didn't dampen Eno's appreciation for KPFA that he appeared during the station's "Brian Eno Day," a twelve-hour marathon of material related to his work: music, music analysis, interviews new and old, and even listener calls. This happened during KPFA's regular pledge drive, and as every American public radio listener knows, pledge drives hold out the promise of desirable thank-you gifts to donating callers. In this case, these enticements included items signed right there in the studio, between turns at the microphone answering questions and chatting with composer-host Charles Amirkhanian, by Eno himself. The autographed Oblique Strategies decks run out first, and even after that people still call in with questions about their origin, their best use, and their future availability. They also (and Amirkhanian, and ambient music expert Stephen Hill) have much else to ask besides, filling the hours — those not occupied by pledge pitches, records Eno produced, or the full length of his own Thursday Afternoon album — with talk of the meaning of his inscrutable lyrics, the recording studio as musical instrument, the making of "Latest Flames," his impatience with computers and synthesizers, his recommended English art schools, and how ambient music differs from new age "muzak." A fan could ask for no richer a listening experience, even 26 years after it first aired — and few more entertaining listening experiences than, toward the end of this long Brian Eno day, the man of the hour's (or rather, of the twelve hours') decision to deliberately answer each and every remaining listener question with a lie. 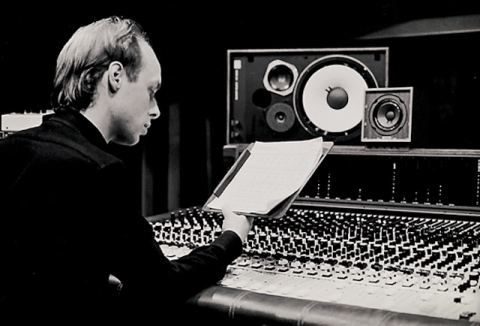 You can stream all of KPFA's 1988 Brian Eno Day above. It's also broken into nine thematic segments at the Internet Archive. Sorry to be off-topic, but I recently found out that no one has ever been able to find any audio or video recordings of the author Thomas Wolfe. This can’t be true! There must be some somewhere. I figured this site was the best place to put out the call. Sometimes you can’t go home again.